Front Flap: "She sprang from the womb and waved to the crowd. Then she smiled and took a bow." And so we first meet Venetia Kelly, the beguiling actress at the center of this new, spellbinding, and epic novel by Frank Delaney, the bestselling author of Ireland and Shannon. January 1932: While Ireland roils in the fun-up to the most important national election in the Republic's short history, Ben MacCarthy and his father watch a vagabond variety revue making a stop in the Irish countryside. After a two hour kaleidoscope of low comedy, Shakespearean recitations, juggling, tumbling and other entertainments, Ben's father, mesmerized by Venetia Kelly, the troupe's magnetic headliner, makes a fateful decision: to abandon his family and set off on the road with Miss Kelly and her caravan. Ben's mother, shattered by the desertion exhorts, "find him and bring him back," thereby sending the boy on a Homeric voyage into manhood, a quest that traverses the churning currents of Ireland's fractious society and splinters the MacCarthy Family. Interweaving historical figures including W.B. Yeats and a host of unforgettable creations - "King" Kelly, Venetia's violent, Mephistophelan grandfather; Sarah Kelly, Venetia's mysterious amoral mother; and even a truth-telling ventriloquist's dummy named Blarney--Frank Delaney unfurls a splendid narrative that spans half the world and a tumultuous, eventful decade." 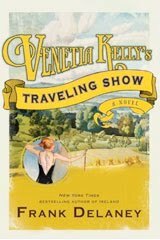 I've just been introduced to Irish author Frank Delaney's writing via his historical fiction novel "Venetia Kelly's Traveling Show" and it totally captured my attention. The story is narrated by Ben MacCarthy, older and wiser now, relating his experiences starting when he was 18 and Ireland was in the middle of political upheaval. His personal life was about to be shaken up as well and would affect him for the rest of his life. Imagine being an 18 year old boy in the 1930's and your father suddenly announces he won't be going home because he's decided to join the traveling show. He is smitten with Venetia Kelly and is willing to drop everything to be with her. Ben is put in the position of going home and telling his mother. She seems to know about her husband's abandonment before he even says one word and orders him to go back and bring him home. He tries, fails, comes back home and his mother keeps sending him back to bring his father home. Through it all, Ben is forced into being an adult and leave the innocence of boyhood behind, albeit not willingly. As Ben narrates the story, he digresses and takes a few side trips which add to his story, not detracts. And the ending - gave me goose bumps. I loved Frank Delaney's writing style and Venetia Kelly's Traveling Show is unique, well written and full of humor, politics, interesting characters and drama. Delaney is a new to me author read and I've discovered he has written many things including radio and theater productions, screenplays, nonfiction to short stories to fiction. I am looking forward to exploring more of his books including "Ireland" and "Shannon." Thank you to Lisa for inviting me to be a stop on the TLC Book tours. Please visit the other hosts and see what those before me and after have to say about Venetia Kelly's Traveling Show. "Venetia Kelly’s Traveling Show is like my Grandma and her nurse shoes. It’s not a pushover. It requires you to pay attention at all times. Even still, I found that the story snuck up on me, catching me completely off guard." "There is so much woven into the novel - Irish political history, mythology and complex characters- that I feel it is a book that can be read on many levels and you may see different things upon reread." "You want to know what I love about Frank Delaney? He’s Irish. And like a lot of the Irish, he’s a born storyteller. And he’s a good storyteller. No, a great one." FTC: book received free from the publisher and I did not receive any compensation for this review. All links are for informational purposes only and not associated with amazon affiliates. Excellent review! I'm so pleased you enjoyed the book and that you plan to seek out more of Frank Delaney's work! I really love how you include snippets of other reviews at the bottom of yours.. I may start doing that too. Thanks so much for being on the tour. We really appreciate all the time and energy that went into reading/reviewing Venetia Kelly! Good review...now I want to read this book! Even before reading the review, the title hooked me in! Please enter me. Sounds interesting. Thanks! I am so glad you liked it too! This was also my first Frank Delaney but I will surely read more! Thanks for quoting my review - I am so flattered!